Microsoft's rollup patch KB3081424 ties together all of the major incremental updates to Windows 10 since the OS went live last week. Windows 10 users, save all your work before logging out today. Microsoft is rolling out a major patch today and tonight that will force a system restart. What’s known as “KB3081424” is a cumulative or “rollup” patch, tying together all of the major incremental updates that have already been applied to Windows 10 since the “release” version went live last week. The page listing the downloads goes on and on, though what you’ll actually receive varies with how up-to-date your PC already is. When I manually asked for the update, it completed in a minute or two over a standard broadband connection. If you recently updated to Windows 10, some of these updates may have already been part of your upgrade. Some are calling this the SR1 rollup, a name that's been used to signify the massive “Day 0” patch that Microsoft was originally expected to release. Because the KB3081424 update does apparently include recent code (some of the files have early August release dates), it’s fair to say that most PCs will receive something new. Why this matters: If you’re using, say, Excel Online, which saves as you go, you won’t have to worry about losing your work. Ditto for Microsoft Office, or any application where autosaving is enabled. But if you’re working in an ancient Web app, or prefer to save your file manually as you go, or simply need your PC to stay up and running all night, be aware that Microsoft thinks differently. 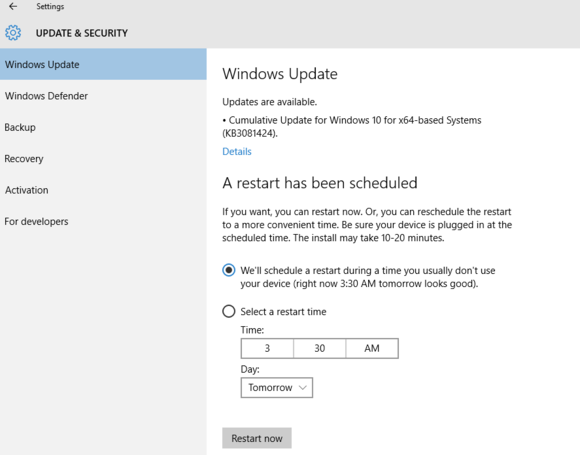 A forced restart isn’t something to panic about, but it is something to be aware of, especially as some Windows 10 updates now can’t be deferred.